At the same time, however, we are facing natural crises unlike anything we have seen before. Every day more and more natural habitat is being transformed and species, some yet to be discovered, are going extinct faster than we can imagine. How is this possible? How can a period of terrible destruction overlap with one of endless potential? What is causing this paradox and how can we fix it? I believe that novel technologies and the philanthropic potential of capitalism have been left untapped by the conservation community. I intend to point out some alternative ways to fund conservation projects in this post. Most of my thoughts were inspired by James Marshall Reilly’s book, Shake the World: it’s not about finding a job, it’s about creating a life; so, if you enjoy this post, check out the book too. 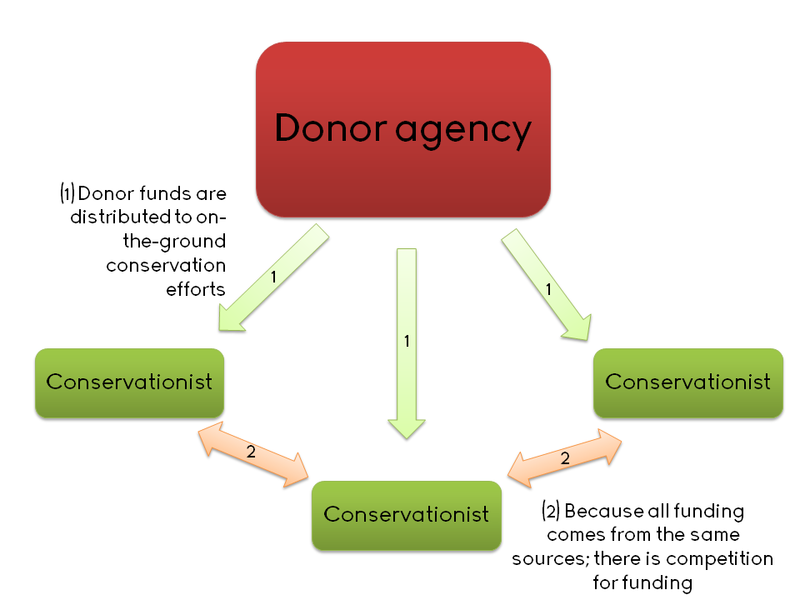 At present, most conservation efforts are funded by donor or grant agencies, governments and NGOs. The money passes through the agency and is distributed to the many on-the-ground projects around the world. Although I am certain that there are benefits to this system there are four glaring flaws. There is separation between supply and demand because the size of the funding pie does not necessarily reflect the need for conservation. Donor funding is vulnerable to economic fluctuations, political events and national priorities. Even a non-economist like me can see this. Top-down disbursement of funds strangles collaboration. Firstly, it creates an “us-and-them” disparity between the donors and the applicant because one group holds all the power. Secondly, because funding is limited, there is competition between conservation projects. It is a zero-sum game and the gain of one project is coupled to a loss of another. Unidirectional funding structures are path-dependent and resistant to novel innovation. It is very simple: many donor agencies want to ensure that their limited funds aren’t wasted, so they invest their money in low-risk, conservative strategies that have shown some success in the past. This also applies to the conservationists themselves; new projects struggle to gain funding because they lack the proven track-record to justify such a financial investment. 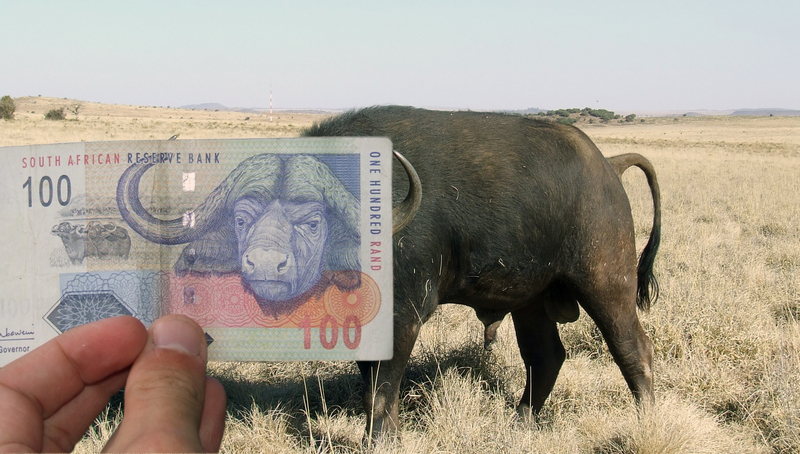 Centralised funding structures can lead to the creation of clumsy bureaucracies, endless paperwork and ineffective use of conservation dollars. I acknowledge that I am painting a one-side picture here. This traditional funding structure has proved successful in the past and I am not calling for the dismantling of the status quo. Nevertheless, there is room for alternative – yet complementary – strategies. Can we change things? I don’t have the answer, but I can highlight some possible solutions. This is not really new but it is simple and intuitive. In a nutshell, small groups of practitioners (or even members of the general public) follow a fixed method to perform a relatively simple and cost-effective task. In most cases, these tasks are self-funded. Each of decentralised compartments feed their outputs to a central coordinator who compiles it and makes the full, aggregated output available to the whole world. This system works because it exploits simple economies of scale. Although the cost of each individual task is constant, its value is not. Financial expenses increase linearly (two tasks cost twice as much as one task) but the value of the output increases exponentially. There are at least three ways that this model can work. First, decentralised data collectors can be used to compile massive datasets that would be beyond the capabilities of any singly institution. Bird Atlas projects are the perfect example of this. Second, a centralised institution can make its data available to the general public if it is unable to process and analyses these data by themselves. Species distribution data and Red List data from the IUCN have, for instance, been analysed by researchers from all over the world. Third, the use of collated data could be contingent on the contribution to the collection of those data. The Nutrient Network (NutNet) follows this structure; members from around the globe follow a fixed experimental protocol to gather data and, in return, they get access to everyone else’s data. The previous approach works well when there is a cumulative effect of many small projects that merge to create something of value. Other times, however, too many cooks can spoil the broth. In such cases, it is better to isolate the best of the sub-projects or solutions and use only that one. Many strategic and/or intellectual problems are like this; the best single answer is better than the average answer based on consensus. But how are sure that you have found the best answer? The only way is to have a big enough collection of possible solutions. Statistically, the chance of having one excellent answer is higher when there are 100 potential solutions than when there are 5 potential solutions (although the probability of any individual solution being the best decreases). Even though 100 possible solutions would give you a better answer than 5 solutions, but it will always cost 20 times as much…unless there is a way only pay for the single successful solution. This is exactly what is captured in the auction model used by initiatives such as Innocentive. Innocentive (innovation meets incentives) embraces crowd-sourcing. 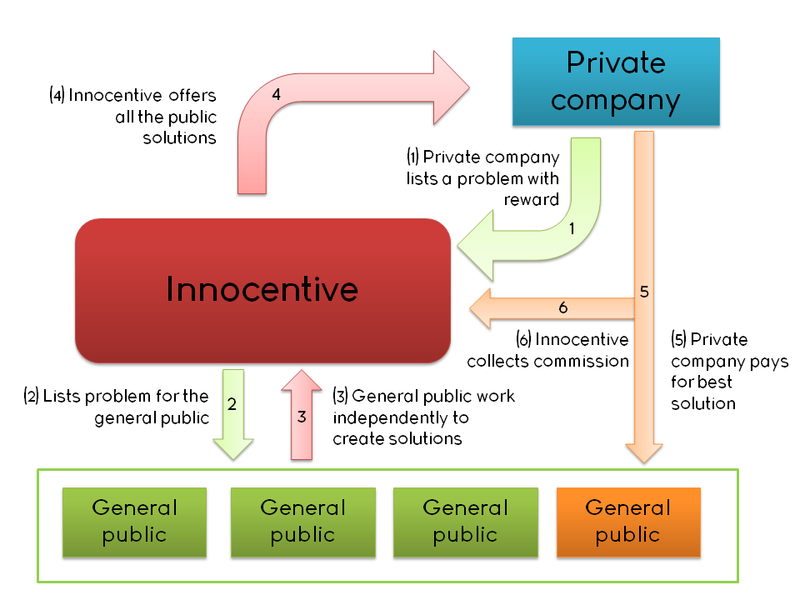 If a private company needs a solution to a tricky problem, they list the problem on Innocentive.com and attach a financial reward for the best solution to the problem. Anyone, anywhere in the world, can view the problems online and, if they feel up to the challenge, try to develop a solution. They do this for free. The private company has an army of capable people working for them on a problem. They do not have to train anyone, they do not have to pay any wages and they are unaffected by the high failure rate of 99% of the unsuitable solutions. It is obvious why they would love this strategy, but why would the masses choose to help a profit-orientated company without certain payment or access to resources? The first reason is the potential financial reward. In traditional research and development (R&D) the budget would be spread across a team; to pay researchers and buy resources. All failures are financed as well. In contrast, the auction model means that all the money goes to the solver of the answer; the individual pay-off is much larger in this winner-takes-all scenario. The same emotional drive that pushes thousands of would-be actors to Hollywood (even when most will fail) is at work in this model. Furthermore, the risk for each solver is actually extremely low. Unlike traditional employment, you do not have tasks delegated to you; instead, you have the choice to select the challenges that meet your expertise. You can work on tasks that you are already good at, those that require a skill you need to learn or even just tasks that you find interesting. Give people autonomy and creative freedom and they will even work for free. 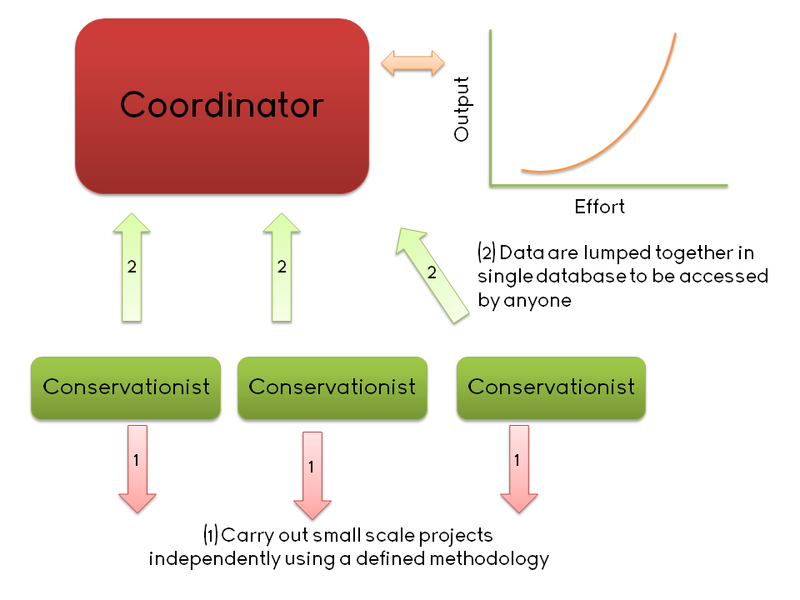 Could this model be implemented in conservation? I think it can. It’ll work if you need access to a world-class team of researchers but can’t afford to pay them all. It might also work for those of us who have innovative solutions and unique skills but aren’t in the position of formal employment to exploit these talents. For most conservation projects, the on-the-ground team has already identified a problem and come up with a solution; all they need is capital to turn a good idea into something tangible. Can the masses fix this? 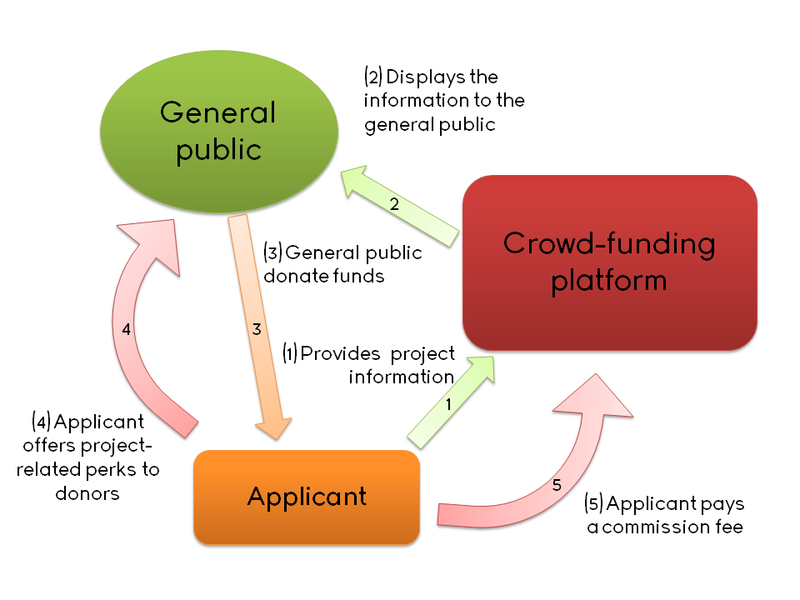 Crowd-funding is one way for decentralised project coordinators to make money. It works like this: details of projects that require funding are placed on a crowd-funding platform (like Kickstarter, Indiegogo or, the more science-orientated, PetriDish). Everyday folk like you and me, browse through the listed projects and choose to make donations to specific projects. Even though there is still a unidirectional flow of money, it is different because the funders are decentralised and, in effect, unlimited. The amount of money available for projects is solely dependent on the number of people who find the project worth doing. Although there is still competition for funding, this is no longer a zero-sum game because available financial resources are less limited than in traditional systems. By offering donors small rewards for their contributions, project coordinators personalise the funding process. Something as simple as an authentic update with photos can transform the donor from a detached observer to someone who is appreciated and involved in the project. Because money comes from many sources, risk is evenly spread between the sub-funders. If a project tanks and loses a few thousand dollars, each individual is unlikely to lose more than 50 bucks. This shared risk means that there are fewer disincentives to support untested, blue-sky conservation ideas. Local folks with social projects appeal to localised money lenders who make small financial loans. The applicants are generally unable to obtain traditional loans from banks because the amounts they need are often very small and they lack any formal credit-record. The local micro-lenders make the loan (with interest) to the applicants who, in return, offer descriptions and pictures of why they need the loan. This material gets posted on Kiva’s website, where the rest of the world can choose to support these projects. Visitors to the website can make a loan (not a donation) towards a specific project. 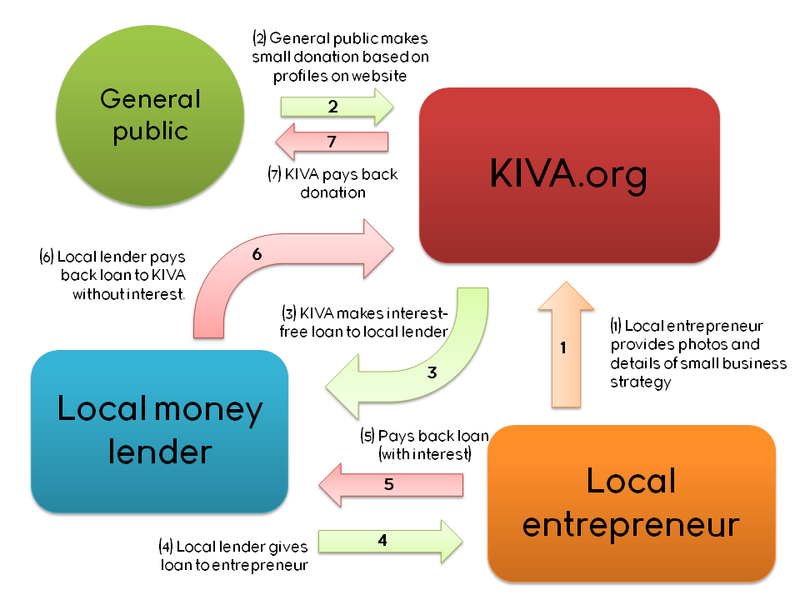 Kiva then lends these individual contributions to the localised money-lenders to provide capital to continue making loans. When the applicants have completed their projects they reimburse the local lenders; with interest. The interest is put towards the running costs of the local lenders and the rest of the amount is returned to Kiva, who pays back the individual loans; without interest. Individual public donors only lose the interest that they would have earned had they invested their money elsewhere. The local applicants benefit because they get access to loans that they would otherwise be ineligible for. Local lenders win because they get capital from Kiva to make loans and they receive interest from applicants to stay afloat. The general public wins because we get reimbursed (and therefore don’t lose any money) while gaining the emotional rewards associated with feeling part of a local initiative; a donor-recipient partnership is transformed into a collaborative partnership. The only loser is Kiva. They don’t make any profit and their running costs actually mean that they are losing money. Auction and crowd-funding platforms charge commission for their services; this is how they make money. Kiva, the other hand, is dependent on donations to survive. On the bright side, however, donations only go towards running costs, not the projects themselves. Traditional funding agencies lose both running costs AND the costs of the actual projects without getting any financial returns on investment. Despite Kiva not yet being fully self-sustainable and donation-independent, it seems much more sustainable than the old way of doing things. Can this model be adapted to conservation? I am sure it can. The only blurry detail is how the conservation project will be able to repay its loan. Most conservation efforts transform financial capital into ecological capital; they don’t make money to repay debts. One way could be create ecological markets where ecosystem capital actually shows up on balance sheets- but this is an argument which falls way beyond this simple little post. The other solution would be that conservationists embrace capitalism, in a way to create revenue from their conservation projects. 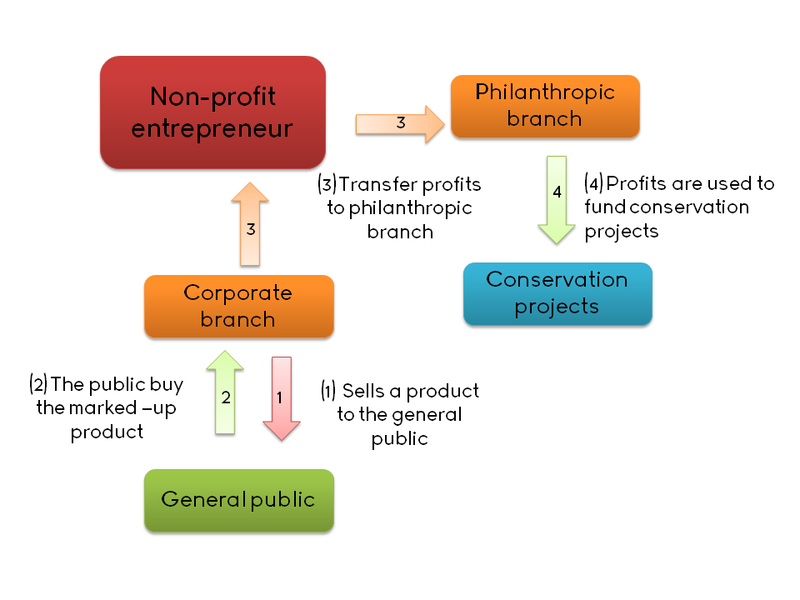 Profit-for-a-purpose works like this: an organisation splits its activities into two separate branches. One branch deals with corporate and commercial issues while the other exists for pure philanthropic purposes. The commercial branch functions like a traditional business in that it sells a product to the general public at a marked-up price. For each item sold, the corporate branch makes a profit. Unlike traditional businesses, however, these entrepreneurs do not reinvest their profits to increase revenue or to pay out investors; instead, the profits are reallocated to the philanthropic branch of the organisation once all running costs have been covered. There are many examples of this type of non-profit entrepreneurship with a conscious. One example is the sale of hand-made curios in national parks where the proceeds contribute to the functioning of the park. Another, increasingly popular, concept is where conservation operations allow volunteers to pay for the chance to contribute to on-the-ground conservation. Students on a gap year or families that want a conservation-experience instead of a traditional holiday can consider professional operations like Operation Wallacea, GreenForce or the African Conservation Experience to plan their trips. I’m sure the many ecologists roll their eyes at the thought of a spoilt kid paying for the chance to gloat about improving the planet but, let’s face it, it is a good way to collect funds and a source of manual labour. Although they sound very similar, profit-for-a-purpose and purpose-for a profit are very different concepts; the former is non-profit whereas the latter is meant to make profits. In profit-for-a-purpose, the aim is to make a profit so that you can carry out a philanthropic goal. Purpose-for-a-profit is the exact opposite. In this model, the idea is to perform charitable actions so that it increases the perceived value of your brand, thereby leading to more profit. Profit-driven companies are diverting money, usually reserved for marketing, into seemingly altruistic endeavours. In doing so, potential customers associate a positive image with the organisation and develop a relationship of trust with the brand. Given a choice, the public will prefer to buy a product from a charitable supplier. Not only do companies that comply gain the more environmentally aware customers, they possibly receive added tax benefits. The good example of purpose-for-a-profit is fisheries that are certified as supplying sustainable seafood by the Marine Stewardship Council (MSC). If the fisheries are proven to run in a sustainable manner, they may display the MSC logo on their products. Individual fisheries are encouraged to use sustainable fishing practices because the brand recognition associated with the MSC logo is quickly surpassing that of individual marketing campaigns. The marketing guru Seth Godin writes that studying entrepreneurship without doing it is like studying the appreciation of music without listening to it. So please remember to take all that I have written with a pinch of salt. Even though there are options to change to way we fund conservation projects, the limiting factor will always be our willingness to try new ideas. While it is possible to learn all the fancy-shmancy business models, no one can teach the emotional strength needed to take a leap into the unknown, untested and unproven. All we can do is try new things and, more importantly, support those who are already doing things differently. 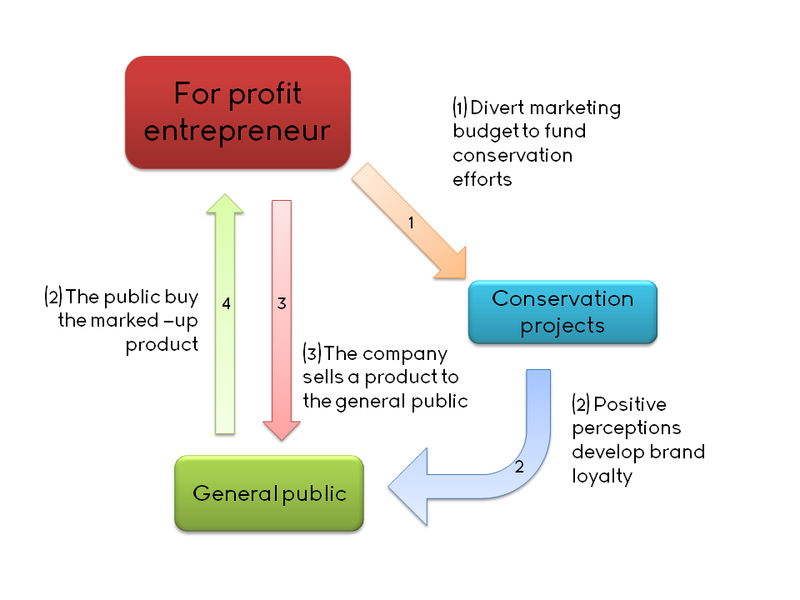 This entry was posted in Conservation careers, Entrepreneurship, New ideas, People and conservation. Bookmark the permalink. ← Is it time to turn your back on the herd? My personal dream in conservation and how the Solitary Ecologist got its name.